Aprons may seem to be a thing of the past, but they’re making a major comeback. Today they come in a range of stylish designs and cute colors to fit your style and mood. Just because they're functional doesn't mean they have to be ugly. A new generation of designers are approaching aprons with a fresh look and an eye towards the modern woman. From plain to frilly, and from bright to muted, these aren't your grandma's aprons! For a fitted apron that won't get stuck in your hair or irritate your neck, check out Susan and Veronica's Sugar Bomb strapless aprons with sweetheart necklines. These cute cover-ups are designed by two former MTV staffers who left the world of television and "decided to combine our years of experience in the entertainment industry into creating a collection of sassy fashionista aprons for today's modern woman." Have some fun in the kitchen with aprons that feature vibrant colors and graphic prints. This funky chicken print from World Market is sure to cheer you up even after you overcooked the roast, while this Indian-inspired print brings some international flavor into your kitchen. For the chic hostess with the mostess, entertain in style with a faux mink apron. Available in brown, white and even festive red, these novelty aprons with satin ties will make you feel like a million bucks. If you're into vintage, then there are lots of great apron options. EllynAnne Geisel of Apron Memories collects aprons and related stories from all over the country and has even written a book on the subject. Using vintage designs and materials, she creates her own hand-sewn aprons in a variety of styles. For a range of super stylish aprons in a variety of styles, head to Unique Vintage. Inspired by the 1950s but with modern touches, these perfectly girly aprons will make you feel like Susie Homemaker after a makeover. From whimsical floral prints with little bows to flirty, ruffled numbers, you'll want to get in the kitchen just to put these on. For a more natural look, these professional linen aprons in neutral colors from Gracious Style might be for you. Made using Belgian flax and woven in Europe, they are of the highest quality and look great while keeping your clothes clean. Linen aprons get softer every time you wash them, so they only get better over time. For a truly personalized apron, check out Practically Necessary where designer and seamstress Kerry Vitali will custom make an apron based on your fabrics. "I can add embroidery and other details," she says, "and I have made aprons from vintage fabrics supplied by the customer. I once made an apron for a young woman getting married that was made partly from clothes she had worn as a child." 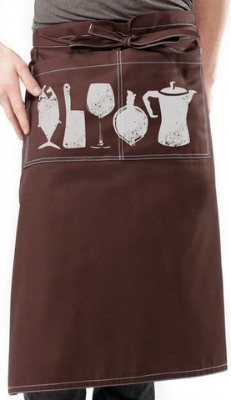 Vitali also has a collection of sweet pre-designed aprons to choose from. Forget "kiss the cook" aprons! Really impress your husband with an apron featuring your favorite NFL team, like these from Williams Sonoma. If there's a rivalry in the household, why not get competing aprons and fight it out over a cook-out? For an apron that you and your husband can share, check out this professional-looking waist down version from Flavour Gallery. In chocolate brown with food-themed white block print, it's stylish on men and women alike. Share with us! Do you wear an apron while you cook? Leave us a comment below! Katherine Martinelli is an internationally published food and travel writer and photographer. In addition to writing for Fabulous Foods, Katherine also contributes to various sections of SheKnows She recently released her first cookbook, Puff Pastry at Brunch: 10 Sweet and Savory Recipes to Start Your Morning (Hang Time Press, 2012). Katherine writes about her adventures in food at KatherineMartinelli.com.